“I had this overriding sensation that this was something that was outside of my control, a message passed down to me from previous generations, as if I was a link in a chain in something far greater.” For Alexandra Kehayoglou, rug making was more of a calling than a choice. Kehayoglou was commissioned by Dries Van Noten to carpet the whole runway for his Paris SS15 show and in doing so instantly gave her work a global audience. This year she participated at the art fair Frieze London, exhibited at London’s V&A and at Chamber Gallery in New York, with an upcoming collaboration with Hermès in 2016. Located in an industrial area of Olivos, a suburban Buenos Aires neighborhood in the north of the city, Alexandra Kehayoglou’s studio is annexed onto the premises of the family business, a vast factory which produces rugs under the El Espartano name, one of the most established and well respected carpet making companies in Argentina. To access her studio we pass by huge industrial looms, with rugs at varying stages of completion. 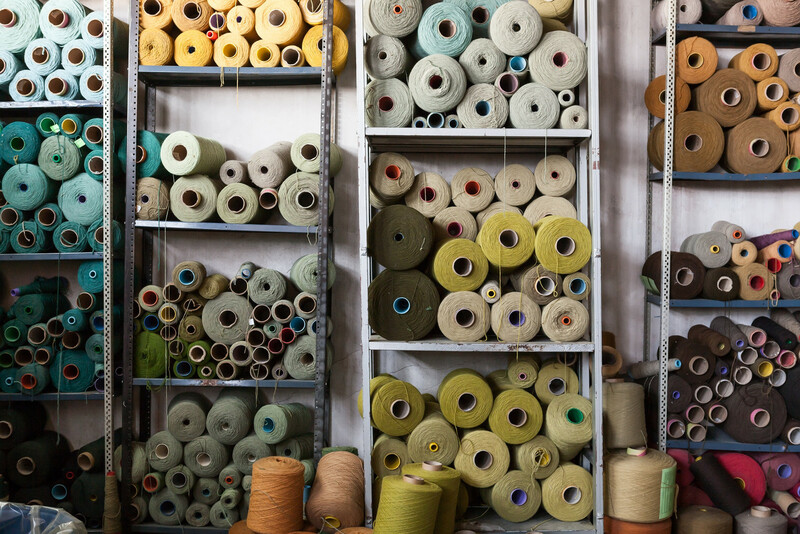 It’s immediately clear to see how this environment shaped Alexandra’s perception and sensibility towards weaving, having spent time at the family’s factory as a child. “I was born into a house with virtually floor to ceiling carpeting. I was raised in a family with a heritage of rug making, my grandparents were from a city called Isparta, now in modern day Turkey, my grandmother brought over her looms and her skills to Argentina handed down from her ancestors, then taught her children.” Alexandra cannot remember how many generations of weavers there are in her family, but says that, much like her father, she grew up with the mandate of carrying on the family tradition. Her studio space is a testament to her assiduous approach, with various works at different stages of completion dotted across the room, and a vast array of yarns married together by shade stacked neatly in blocks. 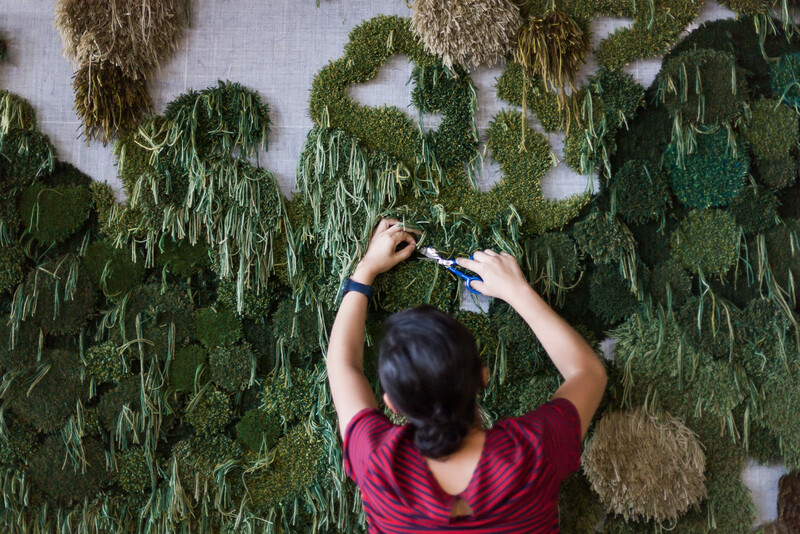 A half-completed piece is mounted in the middle of the room, part of her “Pastizales” series – undulating mounds of woollen tufts of differing lengths and shades emulate an Argentine Pampean landscape, allowing a glimpse into the painstaking process involved. The rugs are woven from behind, with each stitch in the design taking shape on the other side, which calls for precision and accuracy. “The idea of ‘Pastizales’ came about through trial and error. Much of the processes involved in my work have been the product of happy accidents. Creating the first stitch, observing how it looks, and the design materializes according to those initial details.” It’s evident even as she snips, stops and observes the piece in front of her taking form, that there’s a deliberateness to her work. Alexandra invites us to visit her family home where we meet her five-year-old son who, much like his mother, clearly thrives in this natural environment. She gives us a guided tour of her childhood playground — the vast grounds surrounding the property and the flora and fauna of the garden, a constant source of inspiration for Alexandra growing up. She reels off the names of the different species of trees and flowers by heart, stopping at regular intervals to pick up natural mementoes to give to her son, such as a dandelion for him to blow on on her return. Her creations blur the boundaries between artisan craft and contemporary art, rugs given life through use and public interaction, existing both as decorative objects and functional homeware. Although she uses artisanal skills and traditional techniques in her works, Alexandra considers herself an artist first and foremost. She views her creativity as intuitive, and relates to other artists who have a mission to accomplish, producing work with an underlying message to challenge the viewer and public opinion. Yet, she also recognises that her profile as an artist is far from conventional, as is her approach to each work. “Each piece is different. I work with assistants who help me produce the large scale commissions, but even now there are sections that I work on exclusively, which requires a lot of physical effort.” Indeed, the repetitive and painstaking nature of her craft has taken its toll, and she now limits the number of hours she works per day. She likes to work at her own pace, which can involve hours sketching and time alone at home in silence, and vary from sewing a few lines to a full day working on a piece as it nears completion. Thank you, Alexandra, for taking us through your creative spaces and sharing your story with us. See more of Alexandra’s work here. You’ll also find a story on Alexandra in our sixth issue of Companion, available at all 25hours hotels.